Oligospirothioketal (OSTK) rods are presented as an adjustable scaffold for optical membrane probes. The OSTK rods are readily incorporated into lipid bilayers due to their hydrophobic backbones. 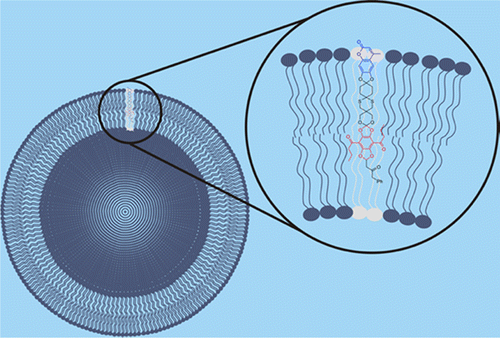 Because of their high length-over-diameter aspect ratio, only a minimal disturbance of the lipid bilayer is caused. OSTK rods show outstanding rigidity and allow defined labeling with fluorescent dyes, yielding full control of the orientation between the dye and OSTK skeleton. This allows the construction of novel Förster resonance energy transfer probes with highly defined relative orientations of the transition dipole moments of the donor and acceptor dyes and makes the class of OSTK probes a powerful, flexible toolbox for optical biosensing applications. Data on steady-state and time-resolved fluorescence experiments investigating the incorporation of coumarin- and [1,3]dioxolo[4,5-f][1,3]benzo-dioxole-labeled OSTKs in large unilamellar vesicles are presented as a show case.